Cretel is a leading manufacturer of food processing solutions for the fish, meat, and poultry processing industry. Cretel also manufactures industrial washing and drying systems for many products including crates, bins, boxes, pallets, and containers. These products mainly serve the food industry, but have also been used for other applications in the pharmaceutical industry, hospitals, logistics, and more. The Cretel product line offers a broad range of equipment to meet all of your needs and requirements. EquipNet is constantly receiving used Cretel equipment through our exclusive contracts with our clients. 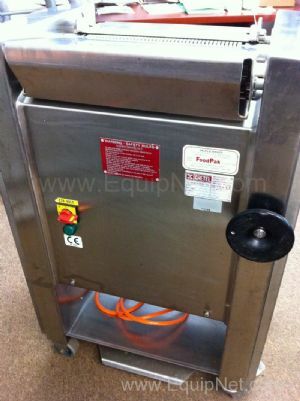 Our inventory of used Cretel equipment includes slicers and more. If you don't see the used Cretel equipment you are looking for, call one of our representatives and we will find it for you. We can also source the right tooling and change parts that you need through our huge network of corporate clients around the globe. Cretel slicers are well known in the meat processing industry for reliability and its innovative applications. EquipNet carries an abundance of Cretel slicers with different features and capabilities to meet all your needs and requirements, including the SB36 meat slicing machine.